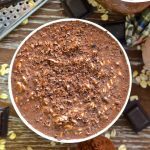 Make your mornings a little less stressful with these Ginger Chocolate Overnight Oats. Wake up to a jar of chocolatey, oaty goodness with a touch of aromatic ginger warmth. And best of all, there is no cooking involved! Add all of the ingredients to a jar or other lidded container. Start with the dry ingredients and end with the milk. Stir well, or put the lid on and give it a good shake. Refrigerate overnight or for at least 6 hours. If you are in a hurry you can reduce the amount of milk by ¼ cup and they will be ok to eat after about 3 hours. For a bit of luxury, grate some chocolate on the oats before serving.